Cardinal Scale’s Scrapper line of truck weighing scales are built for scrap yards, recycling centers, and landscaping facilities in need of a medium-duty NTEP legal-for-trade scale at an economical price tag. The Scrapper utilizes the established PSC high-tensile-strength, pre-stress concrete deck weighbridge that is ten foot wide with lengths up to 52 foot long. The Scrapper series, available from Central Carolina Scale is offered in capacities which range from Twenty Five tons up to Forty-Five tons (25-ton CLC), offering an excellent low-cost scale for mid-sized trucks and pick-up trucks pulling trailers. Cardinal Scale delivers single-source efficiency and excellent engineering employing USA-made stainless-steel model CBC compression load cells. This same deck has been used successfully for the past several years in the Harvester brand truck scale for the agricultural market. The Scrapper series comes in capacities ranging from 25 tons up to 45 tons (25-ton CLC), providing an excellent low-cost scale choice for mid-sized trucks and pick-up trucks pulling trailers. Cardinal Scale offers single-source convenience and quality construction utilizing USA-made stainless steel model CBC compression load cells. The lifting lugs and a foundation template are included with each PSC truck scale order to ease installation. Optional guide rails are available as well. Contact our truck scale sales department today to receive a complete quote including calibration and installation costs. 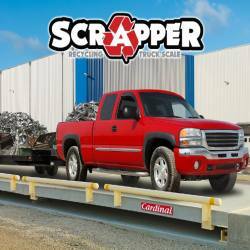 Recycling is one of the fastest growing industries and Cardinal's Scrapper provides you with a durable and inexpensive truck scale.